Throughout the 80s and 90s, the Box to Box Midfielder was a key role in the game. With most teams playing 4-4-2, the Box to Box Midfielder would make up ground for his more technical or defensive partner in central midfield, allowing them to complete their role more effectively. With the popularisation of the 4-2-3-1 in the 00s, the Box to Box Midfielder found himself without a position, with teams favouring a pairing of “Creator and Destroyer”, such as Xabi Alonso and Javier Mascherano at Liverpool. With that being said, there’s often room for a good hard working midfielder. Notable modern examples include Michael Ballack, Steven Gerrard and Yaya Touré, all of whom played in 4-2-3-1 or 4-3-3 formations during their careers, and all to great success. With the introduction of modern tactics such as Vertical Tiki-Taka and Gegenpressing, Box to Box midfielders are starting to find their niche again. Players like Allan at Sarri’s Napoli or Naby Keita at Liverpool are good examples. The archetypal Central Midfielder, the Box to Box Midfielder is an all rounder, the lungs of the team, and someone who, as the name suggests, can make an impact in both boxes. He needs to be hard working, technically gifted and able to read the game well. So how does this translate to FM? If you’ve read my guide to adjusting to promotion, you’ll know that adjusting your tactics to fit your new league status is important. I decided to switch from a Possession based team to a more Counter Attacking style. I ended up with the 4-3-3 you can see below. We’ll be focusing mostly on the three midfielders. I always try to have at least one playmaker when using a midfield three. Usually I opt for a BWM-De, DLP-Su and Mez-At or AP-At. However, my only DM is much more suited to being a Playmaker. A DLP-De and an AP-At left my MCR spot open for someone be the workhorse. Enter the Box to Box Midfielder. On my Madeira save, my Box to Box Midfielder is Rúben Oliveira. You can see the key attributes FM highlights above, but a lot of these come as standard in players I look for. We are looking for high stats across all Physicals, good Aggression, Off The Ball and Work Rate and someone who has a decent Long Shot or Finishing to make an impact in the opposition box. Rúben falls a little short in the last area, but otherwise he is a solid Box to Box Midfielder. 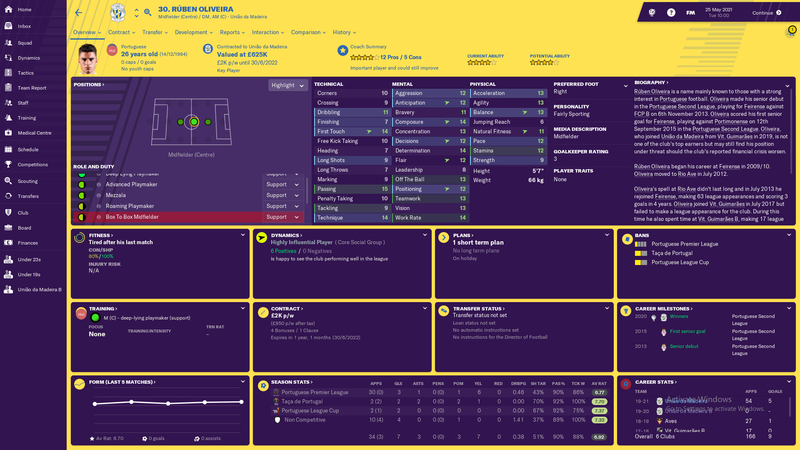 Let’s first take a look at what the role entails within FM, then take a look at his statistics for the season. The best way to understand a role in FM is to read the description and check the Player Instructions. I see so many people asking why their player isn’t doing what they expect of a role, without actually seeing what the game is making them do. It’s really important to first check to see if the PIs match what you want from the player. The only difference between a Box to Box and a Central Midfielder on FM 19 is the PI ‘Roam From Position’. So we’re expecting a standard centre mid, who does work in both boxes and moves with the play to be constantly involved. Turns out this is exactly what you get. I have a few examples of Rúben’s movement during games: a win, a draw and a loss. Here we can see most of Oliveira’s touches are in the opposition half, with a few clearances from in and around the box. He makes a lot of passes through the midfield and makes a few touches in the opposition box. His heat map shows he was mostly positioned on the edge of the opposition box, which is exactly where we want him to be. He even scored the first goal of the game from exactly that position. You can see he moves into a space where he is open to receive the ball, or get to it should it fall to the edge of the area. A more defensive performance away from home, you can see Oliveira makes a lot less touches, however still a lot on the edge of the opposition area. You can also see him tracking back a lot on his side of midfield, making clearances from in and around our 18 yard box. To highlight his work in both boxes, below are Oliveira’s shots, interceptions, tackles and aerial duels. Some important tackles in the defensive third and another goal round off a good performance from the midfielder. This time Oliveira makes himself available from a corner and shows his effectiveness in the opposition box. Again, a lot of touches in the attacking third, but much more clearances and tackles here than the last two games. You can see my BBM tracking back on both sides of the pitch, putting that ‘Roam from Position’ PI to good use. Another couple of shots but no shots inside the box in this game. It’s good to see that the BBM moves where he is needed. A player with less instructions is more free to move where he feels useful, rather than stay in the small box his PIs allows him to occupy. This emphasis on working hard in both boxes allowed me to play a 4-1-2-3 when moving forward but essentially play a staggered 4-1-4-1 when defending. Oliveira was our second highest scorer with 7 goals, tied with my IF. He came third in terms of Shots on Target, which is impressive considering his relatively low Long Shot and Finishing stats. He only created one chance, showing he is clearly the player getting on the end of moves, rather than stringing them together. In terms of his defensive work, he actually made the second highest number of tackles per game (over ten games) behind only my DM, and made the fourth highest tackles overall. He didn’t cover as much distance per game as I’d hoped. He was behind my AP-At and my AMR, and a few other fringe players. We ended up 12th in the league, continuing our attacking intent, scoring but also conceding a lot. A mid table finish is very respectable after back to back promotions and we’ll be looking to finish a bit higher next season. Overall FM seems to emulate the BBM role pretty well. The BBM gets backwards and forwards a lot, making an influence in both boxes, and generally all over the pitch. One thing I noticed from the various heat maps was that Oliveira seemed hesitant to actually get into the opposition box, preferring to sit on the edge of the area. With a more attacking team, I would consider adding the Get Further Forward PI to encourage your BBM to make more of an impact going forward and actually get into the box. Shoot More Often is another good PI, particularly if you’re an counter attacking side where you aren’t attempting to work the ball into the box or if your BBM has good Long Shots and Finishing. The beauty of this role is you can tweak it to what you want from the player, or what suits his ability. Finally I would say that a BBM is only useful if it fits with your style of play. If you’re playing with a two in midfield I would say it’s a great role to use. However if you favour a 4-2-3-1, a pairing of a DLP-Su and BWM-De might suit you better. As long as you understand the roles and PIs, you will understand what you are asking of your players. One thing is for sure, there is still a place for the BBM in the modern game.